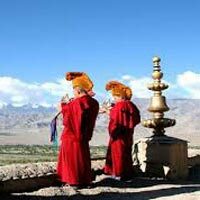 Arrival Leh, Wisdom representative will meet, greet, assist and transfer you to your hotel in Likir. Rest of the day free to acclimatize to the high altitude of Ladakh. 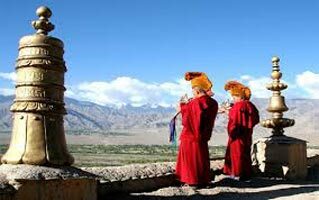 In the evening take a walk in the serene and calm Likir village and visit Likir Gompa. Return to Hotel for dinner and overnight stay in Likir. LIKIR GOMPA : Founded in the 11th century and rededicated to a different monastic order in the 15th century, its earlier Gompa was destroyed in a fire. The present Gompa dated back to the 18th century. Skilled craftsmen producing excellent Thanks, earthen pots and carved wooden folding stools, live here in the village. Majestically situated, Likir commands a spectacular view. A magnificent giant Jupiter tree, one of the few survivors of its species, stands in the courtyard. After breakfast at the hotel drive to Alchi village to see 1000 years old Alchi Dhammchakra Center. Later drive to Leh, enroute visiting Confluence of Indus and Zanskar river, Basgo fort, Gurudwara Patthar Sahib, Magnetic Hill and Spituk monastery. Evening free to stroll around Leh market. Dinner and overnight at the hotel in Leh. After breakfast prepare yourself for the ultimate adventure of your life. We will drive upto the Kardung la Top to have a magnificent view of the surrounding valleys. After spending some time at the top, return to Leh. On the way visit Ladakh first Donkey Sanctuary. Reach hotel in the evening for dinner and overnight stay.